"Join the seals - Push a good thing along. Everything is moving in the right direction at Seal Beach. Climate, transportation, outdoor sports, and all the joys of beach life are ideal at Seal Beach. Forty four miles from Los Angeles. Two splendid lines of transportation. 25 cents round trip by commutation book. Two fine still-water bays. Surf without a danger. An ocean with the undertow left out. Fine lots, 3 blocks from the sea, $495. 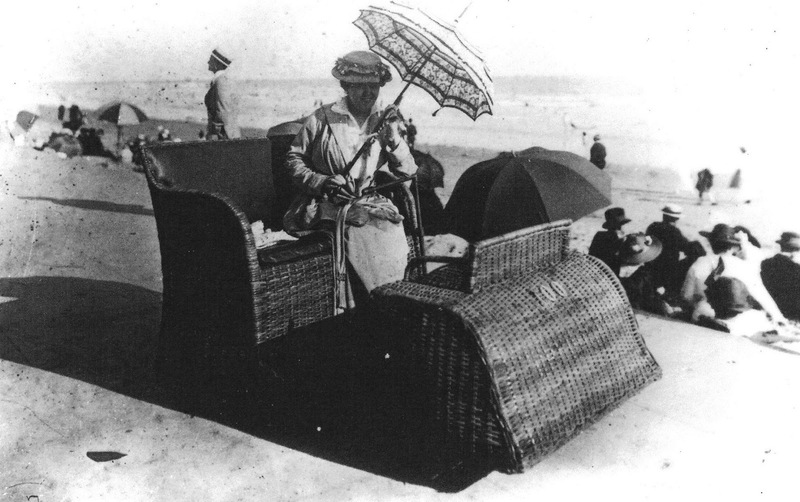 Others smothered in the spray a little more..."
Electric rolling chairs were the latest craze for beach resorts, a fact not missed by illustrator Henri DeKruif. 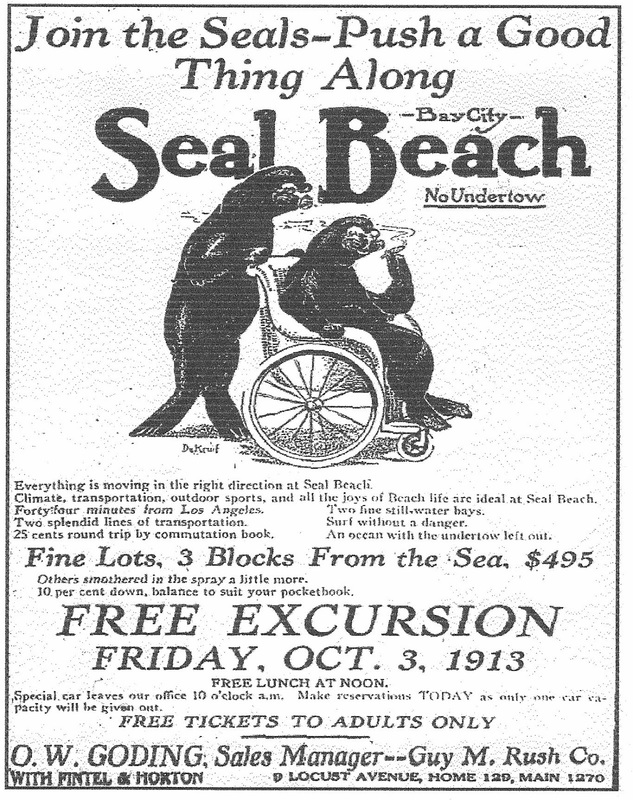 However, Seal Beach wouldn't have rolling chairs until the 1914 summer season. The city celebrated by holding an electric chair race. 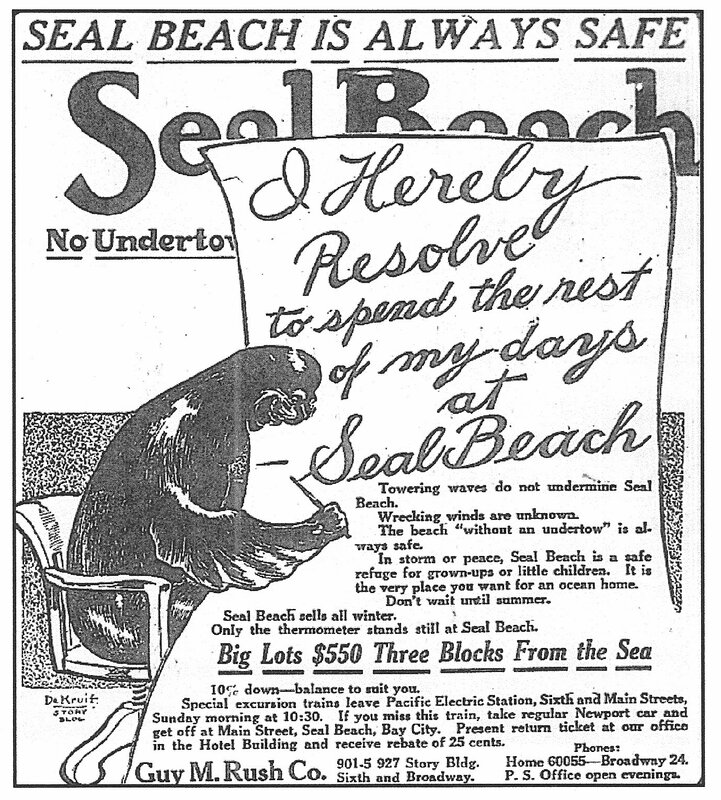 "Make Mr. Seal boost your family fortune. Every swing of the pendulum - every tick of time - Seal Beach rises in everybody's favor. Were you away from home when opportunity called with fortune at the time Long Beach was in its infancy? Were you too late to make money in some of the choicest parts of Long Beach? Have you delayed buying at Seal Beach? Take the judgement of hundreds of shrewd real estate investors --- they have bought over $400,000 in a little over two months". The railroads offered special "universal railroad colonist rates" in September and October. 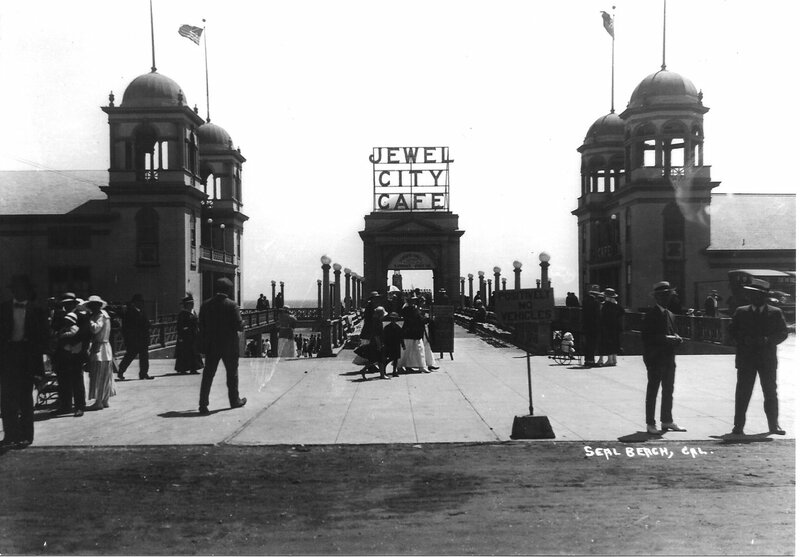 From September 25 to October 10, 1913, 5,000 people traveled cross country to visit the Long Beach/Seal Beach area, according to figures released in the Daily Telegram. The newcomers were prospective residents, prospective businessmen, tourists and home seekers. 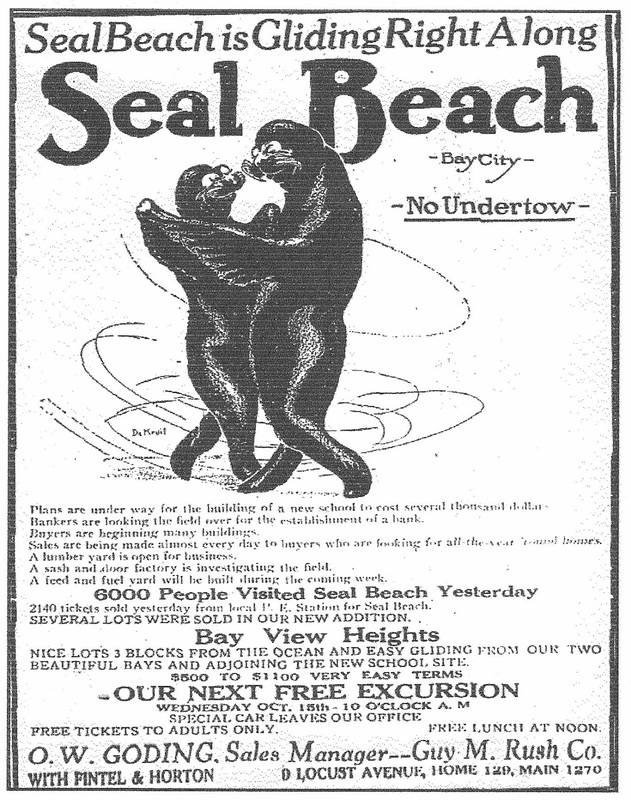 It was important for the Bayside Land Company to continue their ads to encourage these "back Easterners" to establish their permanent homes in Seal Beach. Not lost to the promoters, was the fact that Long Beach had gained the distinction of being the "fastest growing city in the United States" according to the 1910 U.S. census. Why? Because of its fine climate and business growth, something that buyers in nearby Seal Beach could also take advantage of. "Leap Frogging to Fortune. Lots of lots are selling and values are rising every day at Seal Beach (Bay City). Homes - all the year 'round homes - are being built at Seal Beach all the time. A new lumber yard is being opened to furnish lumber and building material. The school has already 35 pupils and more will enter soon. A new billiard hall and barber shop has just been opened. A first class hotel is proving popular. The new Los Angeles boulevard through Naples to Seal Beach will be opened in a few days. Seal Beach is 10 degrees warmer from October to March than Los Angeles and 10 degrees cooler during the summer. Same commutation rate as Long Beach. Two lines of cars..."
On October 10, 1913, the whole way of life on the Pacific Coast changed. At exactly five minutes before 11 a.m. local time all over the nation factory whistles blew, auto horns tooted, flags unfurled, as America engaged in wild pandemonium---the Panama Canal had opened! At 11 a.m. President Wilson touched the button in Washington, signaling the destruction of the Gamboa dike in Panama. The destruction of the dike technically meant that the Panama Canal was completed, but it was not until August 15, 1914, that the first ship sailed through. The canal cut off two-thirds of the distance from New York to Long Beach harbor. The harbor in Long Beach had started operations two years earlier, bringing more wealth and commerce into Southern California and an opportunity for developers to start promoting Seal Beach. To celebrate the opening of the Panama Canal and the discovery of the Pacific Ocean by Vasco Nunez de Balboa, who crossed the Isthmus of Panama in 1513, two expositions were held in California in 1915. The Panama-California Exposition in San Diego specialized in Pan-American themes centered on the Southwest. It opened January 15, 1915, and closed in 1917, after having been extended for a year. The largest one, the Panama-Pacific International Exposition, was held in San Francisco from February 4 to December 4, 1915. Notable were the lighting effects from searchlight-type lamps called scintillators and the architectural unity of the various pavilions. 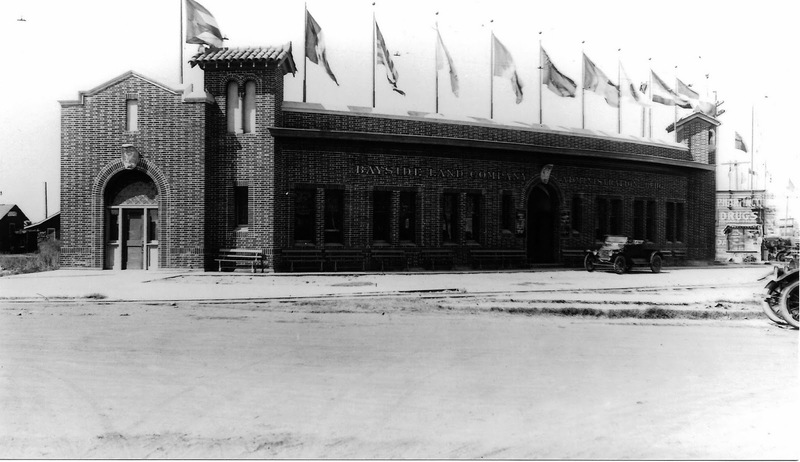 The scintillators and pavilions were purchased by the Bayside Land Company and came to form the new Seal Beach amusement zone in 1916. The Pacific Electric Company has made Seal Beach the transfer point for all its traffic between the south coast and Long Beach. Since the completion of the Long Beach-Seal Beach line on September 9 it has been proposed to change the transfer point on the south coast lines to Seal Beach through Zaferia (East Long Beach) and this has now been done by official orders. It is probable that a schedule of twenty minutes between Seal Beach and Long Beach will be maintained every day, including Sundays, which now has twenty-minute service. The trolley trips which heretofore have used the Newport line will hereafter be routed via Seal Beach and Long Beach, leaving the Newport line at Seal Beach on the return journey to Los Angeles. This action will be followed by the building of a handsome tile and concrete station at the junction of Long Beach and Newport lines at Seal Beach. Traffic on the south coast lines had been increasing every year and practically all of the traffic from Orange County to and from Long Beach will now be transferred at Seal Beach. "Seal Beach is gliding right a long. Plans are under way for the building of a new school to cost several thousand dollars. Bankers are looking the field over for the establishment of a bank. Buyers are beginning many buildings. Sales are being made almost every day to buyers who are looking for all the year round homes. A lumber yard is open for business. A sash and door factory is investigating the field. A feed and fuel yard will be built during the coming week. 6000 people visited Seal Beach yesterday. 2140 tickets were sold yesterday from the local P.E. station for Seal Beach. Several lots were sold in our new addition Bay View Heights. Nice lots 3 blocks from the ocean and easy gliding from our two beautiful bays and adjoining the new school site. 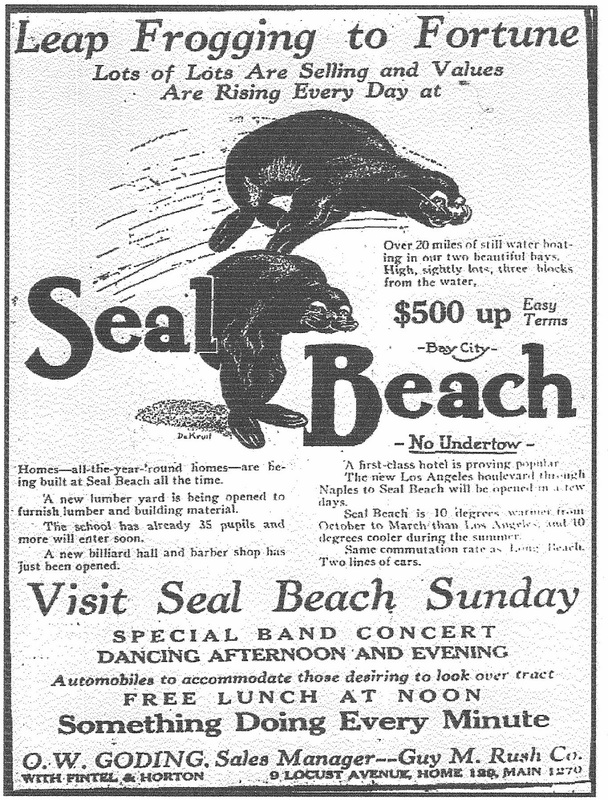 $500 to $100 very easy terms..."
Though this ad says that bankers were looking the town over, it would be nine years before Seal Beach actually succeeded in getting its own bank. On December 2, 1922, the California State Bank opened, immediately attracting 327 new accounts. To stimulate juvenile thrift city founder John Ord offered to add a dollar to the account of the first ten youngsters opening accounts. Hours before the doors opened, there was a long string of young people waiting in the drizzling rain. At the close of opening day the total deposits reached $31,603.33, of which $5700 had been placed in savings accounts. 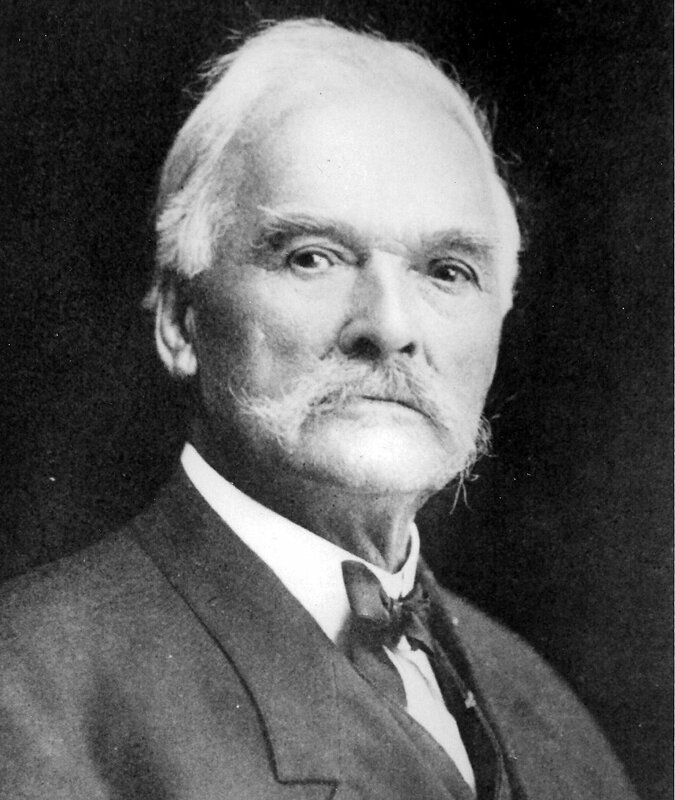 Besides founding the town, John C. Ord was the first postmaster, judge and mayor establishing the first post office and court in his store. He also also added to his income by building and selling houses and lots. Ord was one of fifteen children. He left his family home in Vermont to join the Union Army when the Civil War broke out. He was taken prisoner with 11,000 Union soldiers at Harpers' Ferry in 1862. The entire regiment was released after making a gentleman's agreement not to take up arms against the South again. Because of this agreement, the 11,000 soldiers were sent to Chicago to control an Indian uprising. In 1863, when an official trade of prisoners was made between the North and South, the gentleman's agreement became null and void. Ord returned to active service and served as a sharp shooter and a member of the assigned guard to General Grant. Because of this assignment he personally witnessed the surrender of General Lee. After the Civil War Ord traveled to Canada and got involved in an Irish uprising known as the Fenian Raid. He donned the British red coat and became a member of the Queen's Army. He came to California in the 1870's crossing the isthmus in Nicaragua. After several years exploring California he settled at Grass Valley, later moving to Los Alamitos in 1894, and to Bay City/Seal Beach in 1901. Born in 1842, he passed away in Seal Beach on January 15, 1937. The Seal Beach branch of the Snow Lumber company is reported to be doing a brisk business. Lumber for a feed and fuel yard and several residences has been sold from the yard during the past few days, as well as half a carload of cement. BAND CONCERT FOR SEAL BEACH FOLKS: Site selected for new school occupying entire block; other improvements. Improvements are being carried forward with a rush at Seal Beach which promises to be one of the liveliest resort cities on the south coast. The Snow Lumber Company, of this city, has just opened a yard at that place and the feed and fuel yard, owned by former Senator Coggings, of El Centro, is nearing completion. Three handsome new residences are now under way and more contemplated. The Long Beach and Seal Beach boulevard will be opened next week and development of the new Bay View addition is going forward very satisfactorily and sales continuing briskly each day. An attractive feature of the weekend is the Sunday band concert in the Main Street Pavilion, which has just been inaugurated. A site has been selected for a new school house at the corner of Eleventh, Twelfth and North streets, the site to occupy the entire block. Pacific Electric officials were at Seal Beach during the past week making tentative plans for the location of a new station for that point, now that all of the passengers from the south coast, Orange County and vicinity will transfer at Seal Beach for Long Beach. New schedules are being figured, and it is probable that twenty-minute service will be put in at once on the Seal Beach line. "Activity lasts all the year at Seal Beach. Enthusiasm is now rapidly increasing. The number of lots is rapidly decreasing. Better be safe than sorry. See Seal Beach right now..."
Many beach communities shut down during the winter. 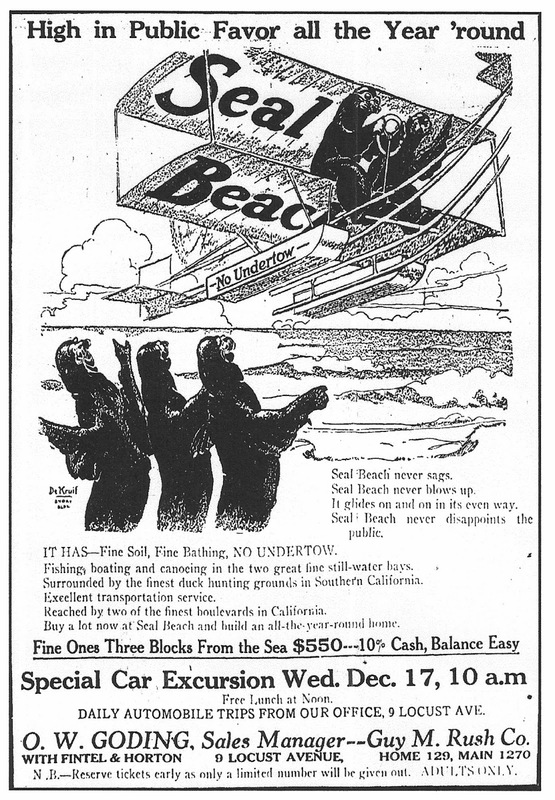 What this ad conveyed was that Seal Beach was active year round. But active in what? Many in Seal Beach would earn their living by illegal gambling and liquor. 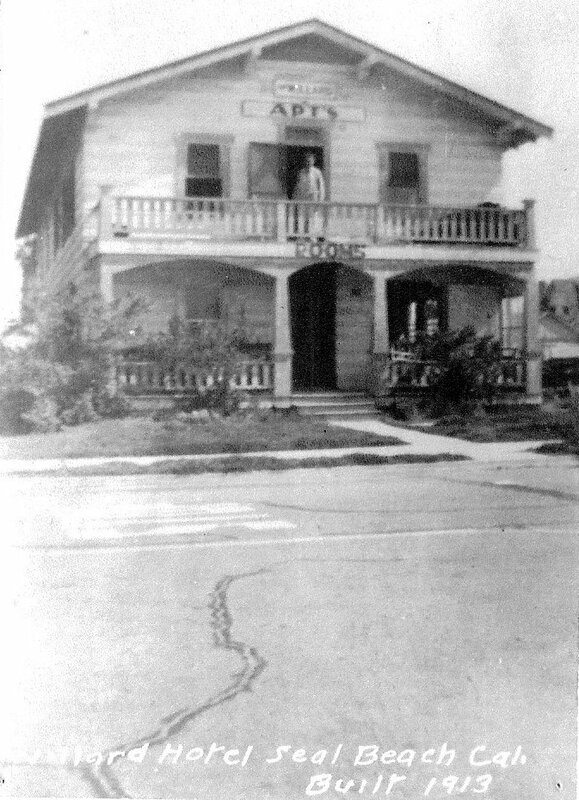 In September 1923, the Seal Beach Inn was raided. Thirty people were arrested on charges ranging from vagrancy to violation of the Eighteenth Amendment (Prohibition). Roulette tables, dice and other gambling paraphernalia were confiscated. At the Jewel Cafe, several guests who had illegal liquor on their tables were also taken into custody. 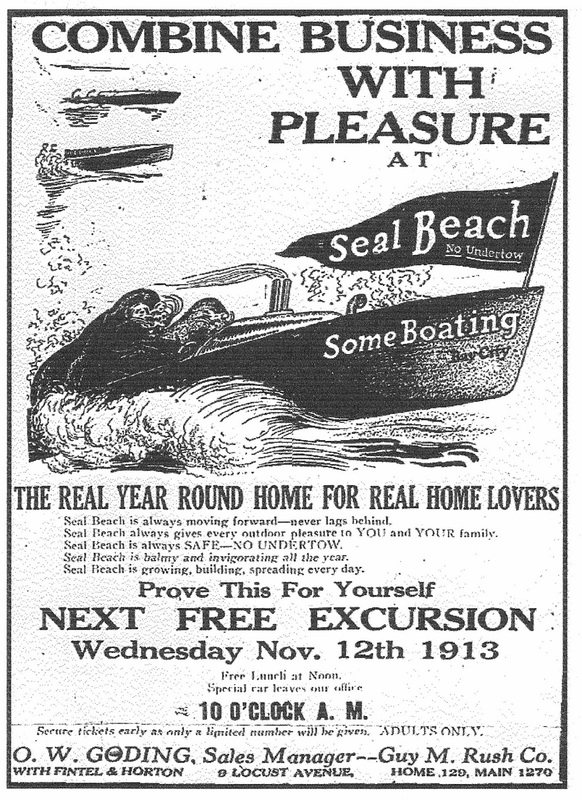 Many had summer homes by the sea, but Seal Beach wanted a permanent full time population. To attract a more "gentile" element, it erected its first church. The cornerstone of a $1500 Methodist church was laid on June 4, 1916, on Sixth street between Ocean and Boulevard avenues according to the Long Beach Press. (Other Seal Beach histories say it was at 149 Tenth Street). The church, which looked like a bungalow, included a reading room and rest room and was open to the public every day of the week from 9 a.m. to 9 p.m. A special invitation was issued to visitors to "drop in at any time." But along with these godly residents came unforeseen consequences. On December 24, 1923, city trustees ordered all amusement and concessions to close on Sundays because year-round residents felt that the Sabbath was sacred. The Women's Improvement Club led the drive for Sunday closing to stop what they viewed as the "lawless element" that was attracted to the town. The Bayside Land Company was not happy with the new law and told the Women's Improvement Club they could no longer hold their meetings at the sun parlor on the end of the pier owned by Bayside. But this was just the start of problems for the Bayside Company. Unable to survive the economic crisis of the 1930's the entire ocean front south of Ocean Boulevard in Seal Beach and 900 lots owned by the company were forced to be sold. The largest foreclosure sale ever recorded in Orange County took place on August 31, 1935, when $295,246.56 worth of property owned by Bayside was taken over by the security First National Bank of Los Angeles. Six new residences and two new business blocks have been started in Seal Beach within the past two weeks, as well as a new feed and fuel yard. The lumber for these has all been furnished from the yards of the Snow Lumber Company which has recently opened up there as a branch of the main yards at Long Beach. The contractors working on the new Bay View addition to Seal Beach, which lies just back of the Pacific Electric main line and extends almost to the waters of Anaheim Bay, are rushing the improvements of this tract. The handsome new pavilion is practically completed. 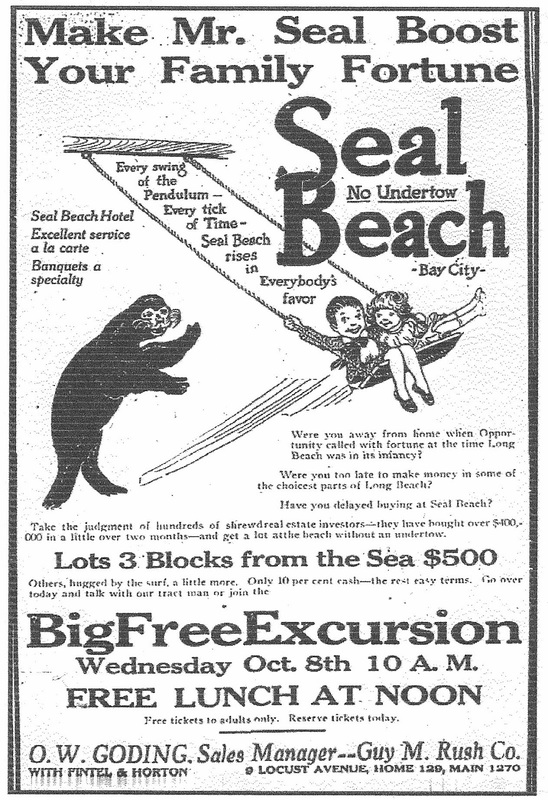 'Seal Beach' will hereafter be the official designation of the Pacific Electric station heretofore known as Bay City. At the request of the Bayside Land Company, based upon the petition of a number of the residents of the south coast place, the Pacific Electric Company will officially change the name of the station from Bay City to Seal Beach as soon as the railway maps and tickets can be altered. In addition to changing the name of Bay City to Seal Beach, petitions are being circulated for the change of the name of the post office from Bay City to Seal Beach, because of the confusion with a similar post office known as Bay City in one of the northern counties, as well as the natural confusion that comes because of the reference to San Francisco as the Bay City. BOULEVARD BUILT TO SEAL BEACH: Last link in Good Roads System of Los Angeles County Completed. The last link in the good roads system of Los Angeles County, connecting Seal Beach with the boulevards to Long Beach, Redondo and the harbor, was finished last week, and with the exception of two concrete bridges which are just being finished, the work is complete. Work on this section, which is the last of the good roads systems of Los Angeles County, has been in progress for several months, and it leads up to the Orange County line, where Orange County will begin improvements aggregating nearly $2,000,000 for good roads throughout the county. Orange County will carry this boulevard through the center of Seal Beach, one boulevard branching to the east, paralleling the coast to Balboa, and ultimately to San Diego, and the other branch to the northward to Santa Ana and the interior of Orange County. 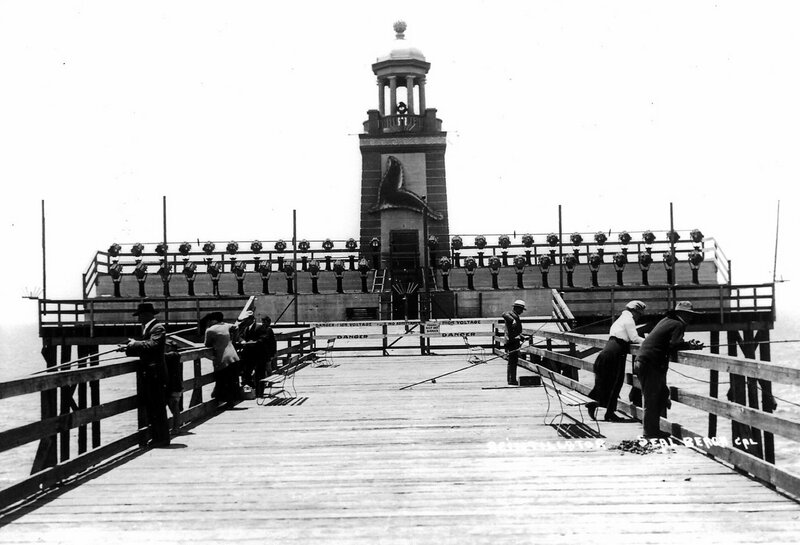 "The Boulevard is Completed to Seal Beach. 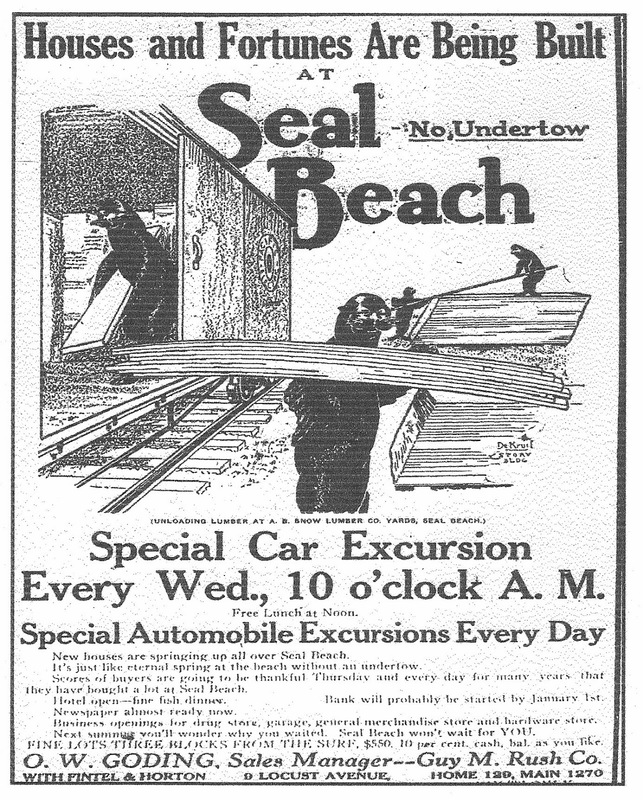 Get your motor car and spin over to Seal Beach. Our representative is always on the ground, and will be pleased to show you around. Remember - Seal Beach is the fastest selling subdivision in Southern California today. $500,000 worth of property sold in ninety days...There are so many good things to tell about Seal Beach that space will not permit. So come with us and see it for yourself and let us tell you all about it." A three-mile highway down Ocean Avenue led from Long Beach to Seal Beach. One could reach Seal Beach by automobile from Los Angeles in little over an hour. It's interesting to note that around this same time Henry Ford was setting up his first auto assembly line for the Model T. Between 1909 and 1924 the price of a Model T. would drop from $950 to $290. This lower cost for automobiles made them more affordable to the American public. With more autos on the scene better roads were called for. 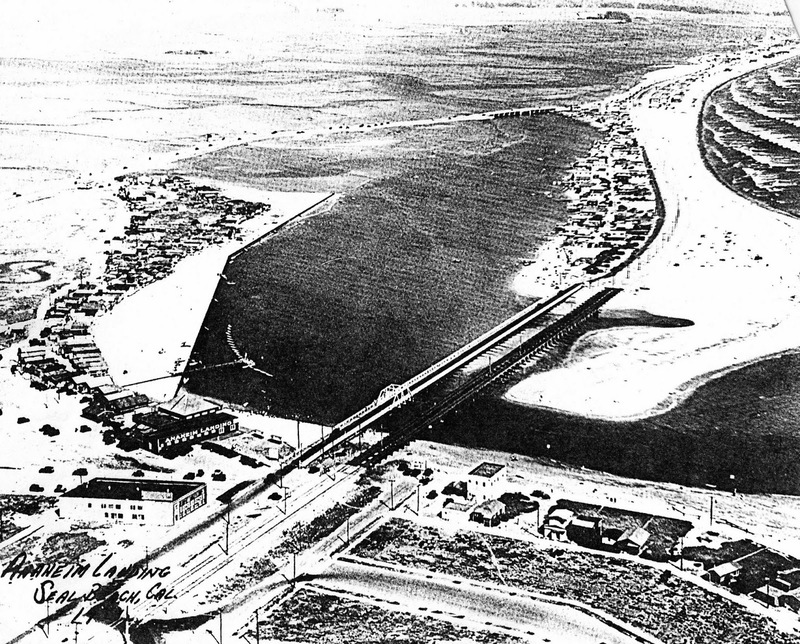 On March 25, 1925, a new "Pacific Coast" Highway opened through Seal Beach all the way to Newport. More than 200 automobiles were lined up on either side of a luckless autoist who was having trouble with his machine on the Long Beach-Seal Beach boulevard yesterday just this side of the bridge over Alamitos Bay. Mr. and Mrs. R.L. Bisby, returning in their auto from Santa Ana, were in the number of those stranded on the narrow boulevard until the trouble could be remedied. Bisby, with characteristic impatience at delay, got out and commenced to give directions to the constantly increasing army of autoists, lest there be some further accident in the crush, when Mrs. Bisby quietly reminded him that his authority, as secretary of the Chamber of Commerce, might perhaps not extend to auto mix-ups on the road, and warned him therefore to be careful lest he take in too much territory. The secretary appreciating her joke, laughingly started to jolly-up the gang and the fun-making spread like measles, so that everybody was in good humor by the time the recalcitrant motor was coaxed into activity once more. The incident proved an eye-opener to all concerned, who little dreamed until they saw the autos bunched together on the road what a heavy traffic passes between here and Seal Beach on a busy Sunday afternoon. safest beach - absolutely no undertow. The finest climate-warmer in winter-cooler in summer. Two great still-water bays, affording fine boating, bathing and fishing. The best transportation-two lines to Los Angeles-frequent cars. Low fare to and from city and Long Beach---good soil. First class improvements all included in the price of lots. Great activity in building." 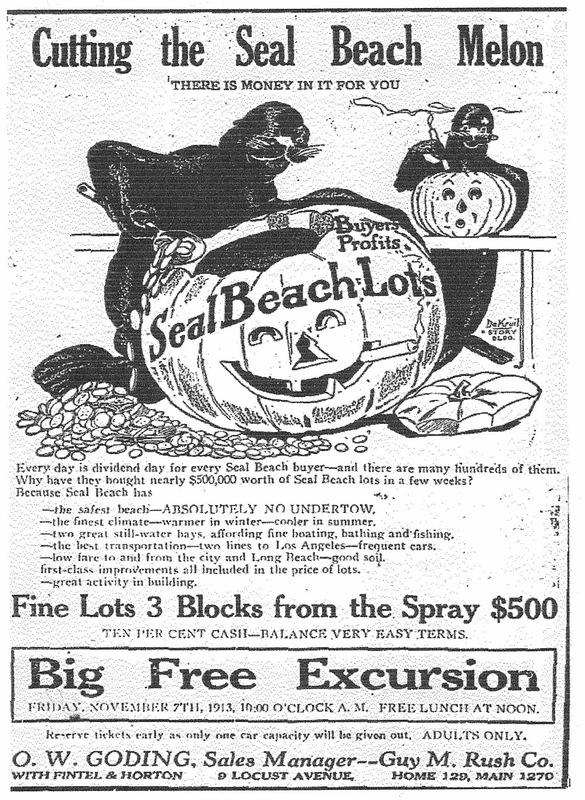 This November 5, 1913 ad, with the seal carving a pumpkin, brings to mind Mrs. Jan DeArmand and her love for Halloween. In the 1930's, Mrs. DeArmand began giving Halloween parties at her home at 128 Eighth Street in Seal Beach for her young daughter, Jacqueline, and Jacqueline's friends. By 1950 Mrs. DeArmand's Halloween celebration had become a community-wide event attracting over 600 youngsters. Each year the DeArmand's constructed an elaborate entrance way leading into their yard. Inside there was a jungle booth, set up so sharpshooters could shoot cork popguns at wild beasts; a bean bag throw; fortune telling booth; lemonade, hot dog, popcorn and peanut stands; cotton candy machines and amusement rides. Everyone was encouraged to wear costumes and prizes were awarded for the best ones. But the event grew too large for the DeArmand's to handle all by themselves. Civic organizations such as the Junior Woman's Club, Parent-Teachers Association, Lions Club, American Legion, the Chamber of Commerce, and local newspapers chipped in to handle the Halloween celebration. 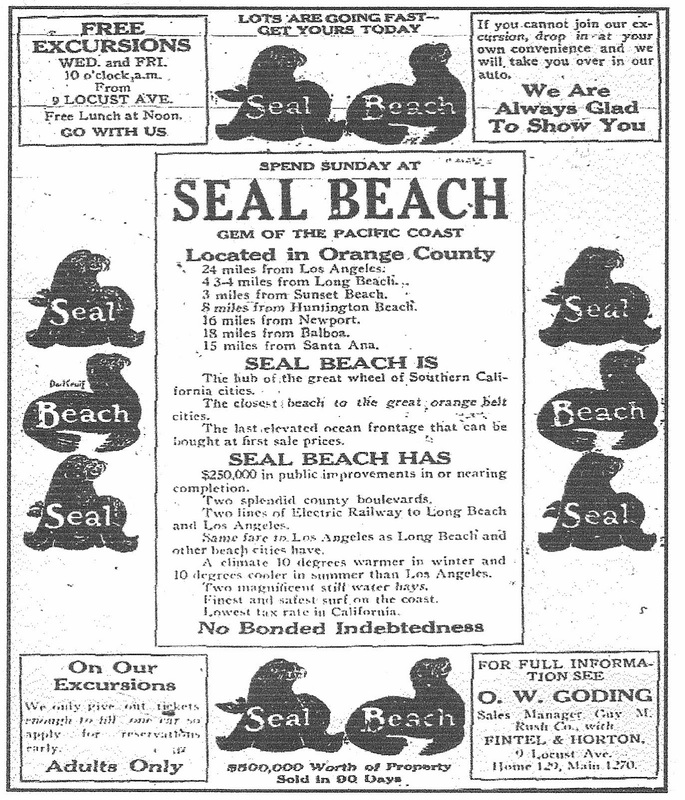 "Combine Business with Pleasure at Seal Beach. The real year round home for real home lovers. Seal Beach is always moving forward, never lags behind. Seal Beach always gives every outdoor pleasure to you and your family. 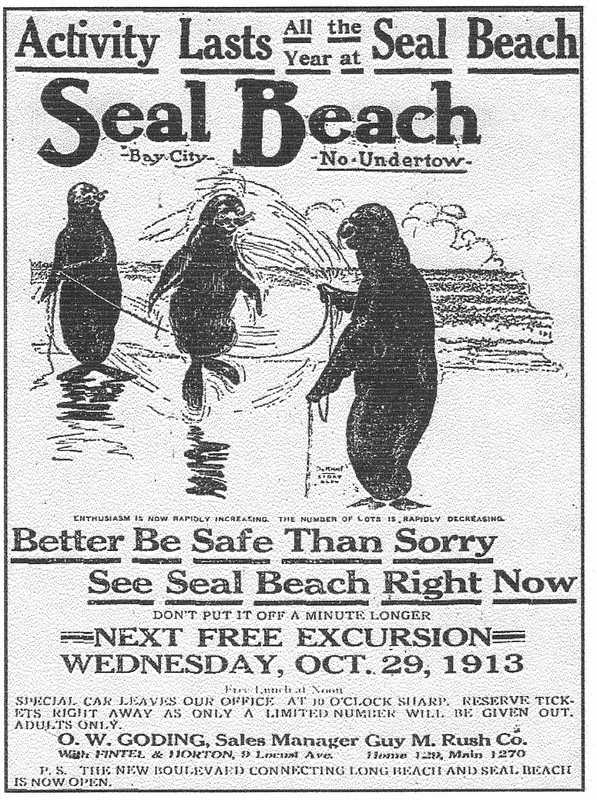 Seal Beach is always safe, no undertow. Seal Beach is balmy and invigorating all the year. Seal Beach is growing, building, spreading every day..."
There were a number of powerboats kept in Anaheim Bay. Seal Beach was a perfect place for boaters to come to after a busy week at work. They could fish, go duck hunting in the inlet bays, or take off for a day at Catalina Island. However, larger boats were to come. In January 1944, the bayside area of Seal Beach known as Anaheim Landing was dismantled and the Seal Beach Naval Ammunition and Net Depot constructed in its place. Commissioned on November 2, 1944, under the command of Captain A.B. McCrary, the base supplied the ammunition used by all Navy ships on the West Coast. To this day, ships of various sizes are frequently seen at Anaheim Bay loading and unloading ammunition. In 1946 a campaign to create a West Coast Naval Academy at Seal Beach got underway. Though nothing became of it, high ranking Naval officials felt the Naval Net Depot and Fort Bolsa at Bolsa Chica near Huntington Beach could provide land enough to house the proposed Annapolis of the west. stand between you and the purchase of Seal Beach lots you will never receive your share of the splendid profits to be realized by our investors. Pause, look, listen, act and act quickly for things are moving lively at Seal Beach..."
members of the film troupe celebrated at the Jewel City Cafe. Buster entertained his friends by performing a snake dance, the snakes consisting of a string of hot dogs. He also donned a tablecloth to cover his clothes and had two napkins hanging from his ears. It must have been quite a night! California cities. The closest beach to the great orange belt cities. The last elevated ocean frontage that can be bought at first sale prices. Seal Beach has $250,000 in public improvements in or nearing completion. Two splendid county boulevards. Two lines of electric railway to Long Beach and Los Angeles. Same fare to Los Angeles as Long Beach and other beach cities. A climate 10 degrees warmer in winter and 10 degrees cooler in summer than Los Angeles. Two magnificent still water bays. Finest and safest surf on the coast. Lowest tax rate in California. 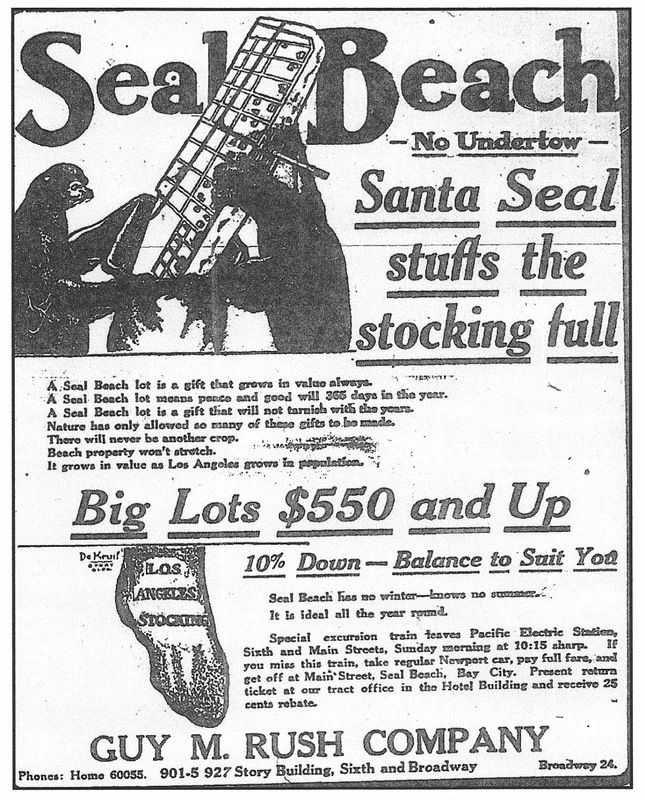 No bonded indebtedness..."
Seal Beach relied on tourism, but it needed year-round residents. During the winter months it needed to sell itself as a permanent residence within an easy commute to jobs in Los Angeles and Orange counties. Though it never wanted to become an industrial center, several substantial industries did move to the community. In the 1940's one could find the Dow Chemical Company, the Los Angeles Bureau of Power and Light generating plant, and the Sport Craft boat building yard furnishing employment for a number of workers. SEAL BEACH SAND DUNES LOWERED: Work Being Done to Make Way for Bulkhead of Cement on Front. The sand dunes that have lined the shore at Seal Beach for the last many years are being taken away and placed on the property lying just back of the Pacific Electric tracks. An enormous electric pump, or sand dredge, has been given the job of transferring the big piles of sand through the pipes to the land which is being raised to grade. After the dunes are removed earth will be spread over the property being filled. This work is being done to make way for the cement bulkhead that is to run the length of the ocean front at Seal Beach, and for the thirty-foot promenade which is to extend from Anaheim Bay to Alamitos Bay. Handsome electroliers, each with a cluster of five lights, will cast their glow on the promenade in the evenings. 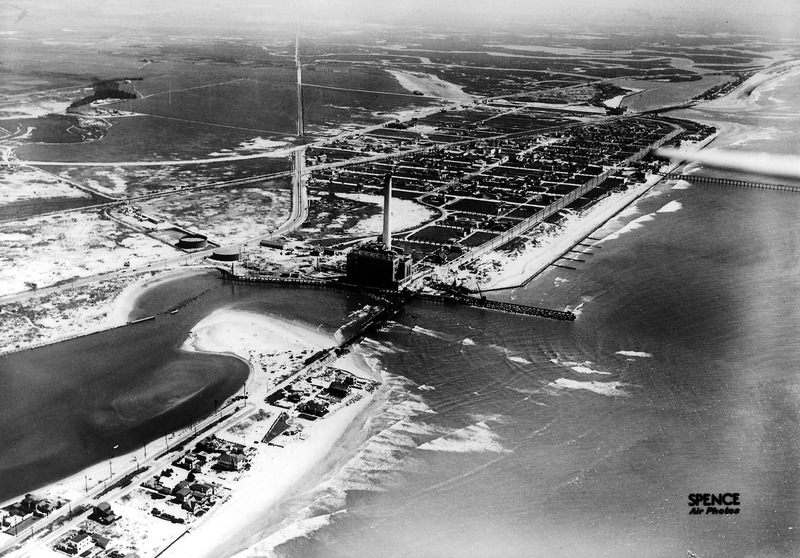 Three hundred rental cottages were built at Seal Beach in 1913. They could be rented for a week, month, or the entire season at prices ranging from $5 a week on up. You might, however, want to stay away from 13th Street. There sand dunes as high as sheds graced the beach. During windy days sand would completely cover porches of cottages on Ocean. The only way out of one house was through a side window on the north! 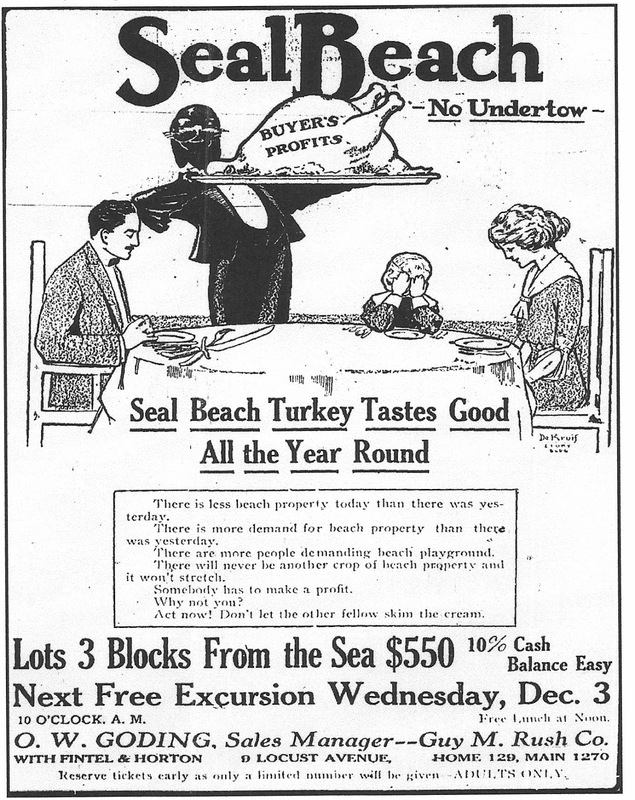 "Seal Beach Turkey Tastes Good All the Year Round. There is less beach property today than there was yesterday. There is more demand for beach property than there was yesterday. There are more people demanding beach playground. There will never be another crop of beach property and it won't stretch. Somebody has to make a profit. Why not you? Act now! Don't let the other fellow skim the cream..."
Seal Beach had much to be thankful for, in four months $610,000 worth of property had sold. In 1929, the City of Seal Beach would really give thanks when a new two-story City Hall opened at the corner of Central Avenue and Sixth Street. Since its incorporation in 1915 municipal offices had been housed in a two-room converted restaurant. The Police Department, City Clerk, Water Department, City Judge, City Engineer and all other municipal employees worked side by side. With the new City Hall there were separated offices for all departments. A large auditorium was located on the second floor with a kitchen amply supplied with essentials needed to hold banquets or meetings. One of the major features of the hall was a three-room apartment furnished for one of the police officers and his wife and a library built in the north wing of the building. "Seal Beach is Gift Laden All the Year. It gives to you, a surf without an undertow. Two great beautiful bays, ideal for boating, bathing, fishing hunting and canoeing; fine boulevards and streets; a twin amusement pavilion, costing $1000,000 and the finest on the coast; an ideal all-the-year climate, 10 degrees better than Los Angeles summer or winter' electricity, Water, cement curbs and sidewalks all included in the price of lots." Artist Henri De Kruif has decorated the seals' Christmas tree with things the community was thankful for---the arrival of the new Pacific Electric rail line and numerous new buildings. Anticipating a great increase in the automobile traffic to and through Seal Beach upon the completion of the Orange County good road boulevards that will extend from this resort, arrangements were made this week by local automobile men for the building of an up-to-date garage on North Main street, which is one of the main laterals. It is expected that the work on the boulevard leading from Seal Beach to the north, by way of Main street, will be started by the first of the year, and it will no doubt be completed before the summer season opens. All of the streets in the town are to be resurfaced and put in first-class condition before the summer months. glides on and on in its even way. Seal Beach never disappoints the public. It has fine soil, fine bathing, no undertow. Fishing, boating and canoeing in the two great fine still-water bays. Surrounded by the finest duck hunting grounds in Southern California. Excellent transportation service, reached by two of the finest boulevards in California. 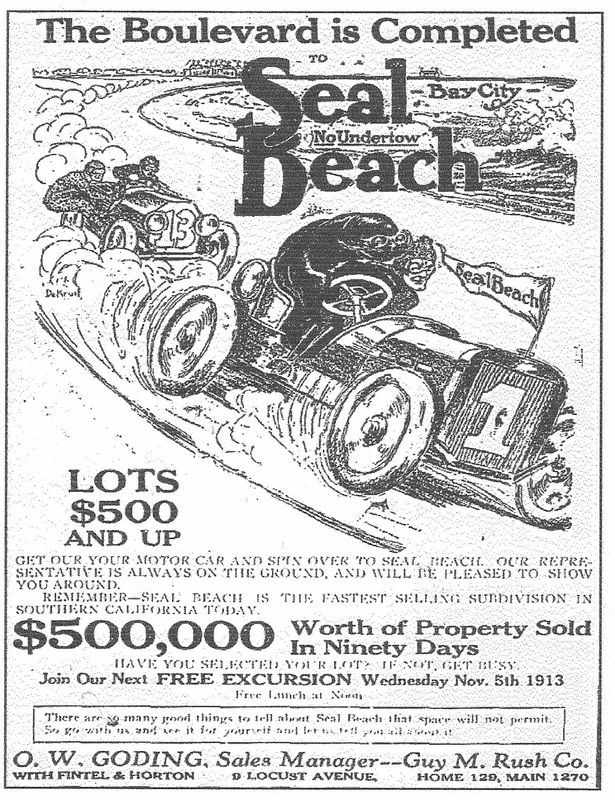 Buy a lot now at Seal Beach and build an all-the-year-round home...."
Since the first U.S. air races were held at nearby Dominguez in 1910, and Cal Rodgers made the first transcontinental flight from New York to Long Beach in 1911, flying had become a popular past time. Crowds gathered whenever one of the air machines flew overhead. They knew aviation was a dangerous sport, with death always lurking in the background. In 1916, Seal Beach promoters lured Long Beach aviators to their city by establishing an airstrip north of town and building a $1500 hanger to house the airplanes for free. Fliers were anxious to leave Long Beach where local politicians listened to residents complain about airplane noise and attempted to regulate flying. Seal Beach was happy to have the aviators with their air machines in their city---it was one more tourist draw. "Santa Seal Stuffs the Stocking Full. A Seal Beach lot is a gift that grows in value always. A Seal Beach lot means peace and good will 365 days in the year. A Seal Beach lot is a gift that will not tarnish with the years. Nature has only allowed so many of these gifts to be made. There will never be another crop. Beach property won't stretch. It grows in value as Long Angeles grows in population..."
Christmas was a special time in 1913 America. Two-thirds of all toy sales came at Christmas and many stores carried no toys at all the rest of the year. Just as toys were limited so was seaside property; nature only made so much. 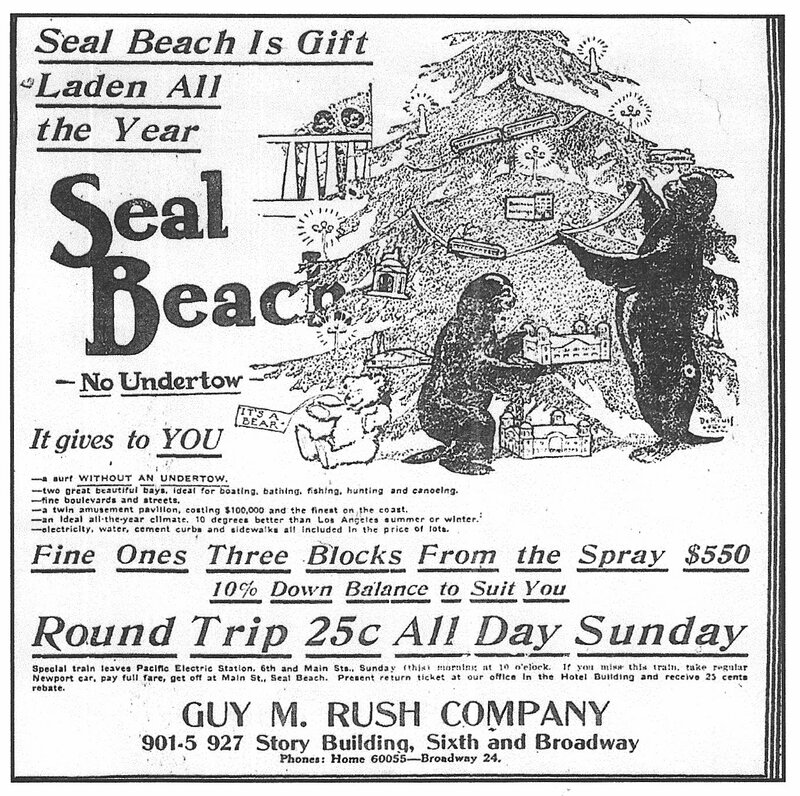 Why not give a gift of Seal Beach real estate as a Christmas gift to yourself?
" I hereby resolve to spend the rest of my days at Seal Beach. Towering waves do not undermine Sal Beach. Wrecking winds are unknown. The beach without an undertow is always safe. In storm or peace, Seal Beach is a safe refuge for grown-ups or little children. It is the very place you want for an ocean home. Don't wait until summer. Seal Beach sells all winter. 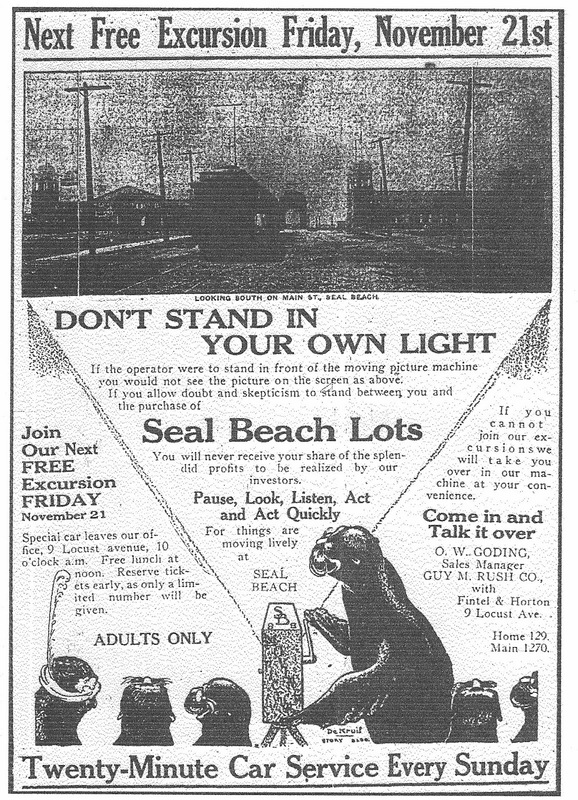 Only the thermometer stands still at Seal Beach..."
Many did resolve to spend the rest of their days in Seal Beach. One of them, W.L. Robertson, a former Los Angeles police detective, opened a Quonset hut casino, the Airport Club, in 1950. 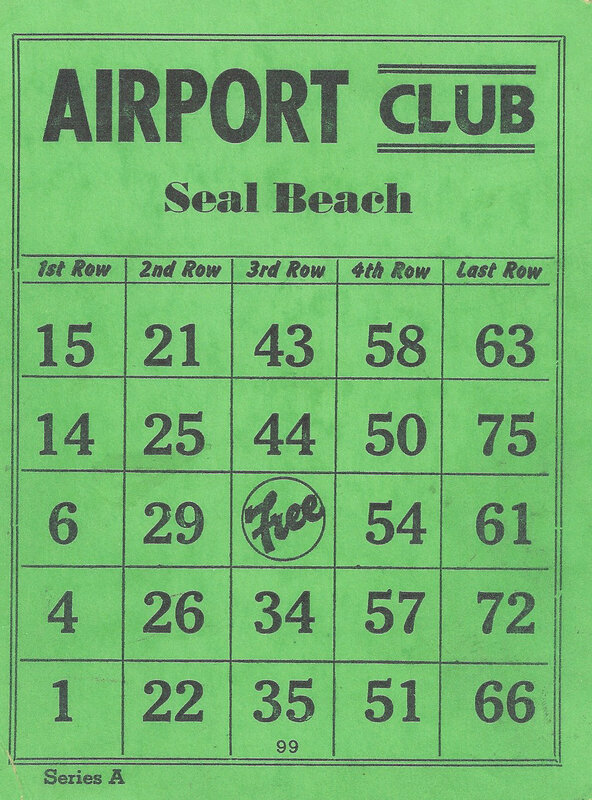 Angry Seal Beach citizens successfully banned gambling from their city in 1954. Robertson, however, still came out a winner, having obtained extensive real estate holdings in Seal Beach during the heyday of his gambling hot spot on Pacific Coast Highway. The poker king became a real estate tycoon. IN THE NEXT BLOG: The news was good, the Daily Telegram reported November 29th 1913. The railroad had just released statistics on passenger rates for the year and the Long Beach/Seal Beach area was the second greatest tourist destination in Southern California (Los Angeles was first, San Diego third). In November alone 9000 visitors arrived to enjoy the wonderful fall weather... but things were soon to change as the wonderful weather took a drastic turn.